closed on Sunday, February 19.
and boost our creativity and have some fun! On Monday, February 20, we will again be celebrating 20 years of Bear Patch fun! All year, the 20th of the month means Party Time at the store! Back in grade school, we always looked forward to bringing cupcakes to school for our birthday. So Bear Patch will have cupcakes for you on Monday (while they last)! In addition, we will have another treat for you! This is for anyone who visits the store on Monday, no purchase required. We will be handing out a cute little "KeeZee" for everyone! 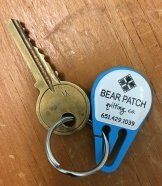 This is a great little gadget that will help anytime you are sliding keys on or off your split-ring keyring! No longer a struggle with pinches and broken nails to change those keys! And since Monday is an official holiday for so many of you, we hope to see many familiar faces! We want to celebrate the holiday with you and pass along some rewards, too. President Debbie has added a chance for you to get some reduced prices! You can draw for a discount of 15% up to 40% off your purchase of fabric, patterns and books! We're open all day Monday, 2/20, from 9 AM to 9 PM! Call us at 651-429-1039 if you have any questions!